This movie rewinds back to 1987, the never-ending battles between the Autobots and the Decepticons Seeking protection, the Autobot leader Optimus Prime sends the brave yellow soldier B-127, to Earth. Once B-127 lands in a forest on earth he is seen by a group of men conducting basic training and immediately discovers he is in trouble. B-127 is also being followed by one of his enemies, who rip out the technology that allows him to speak, forbidding him from announcing his purpose or his whereabouts and establishing one of the famous features of the character. B-127 then finds refuge in a junkyard in a small Californian beach town. 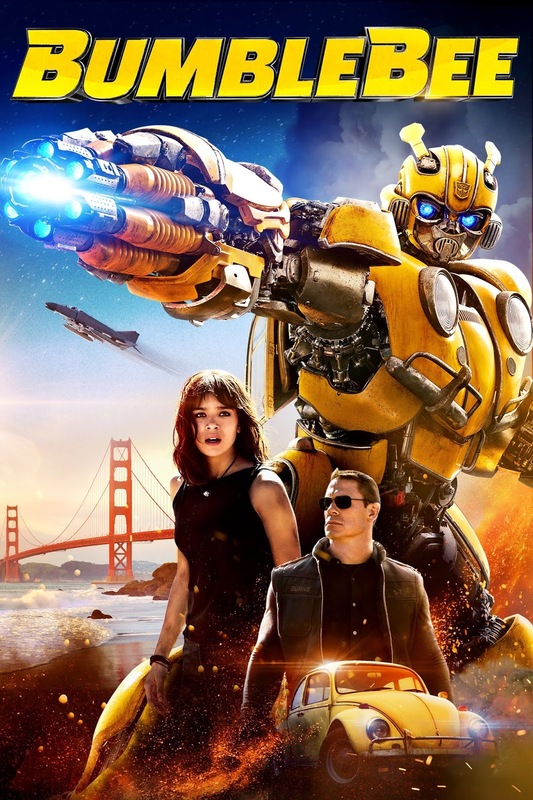 Charlie, on the cusp of turning 18 and trying to find her place in the world, discovers B-127 and gives him the new name of Bumblebee, battle-scarred and broken. If you're a fan of the original cartoon like my husband you’d best be geeking out at how this movie keeps faith with the cartoon's visual aesthetic and sound. Bumblebee returns to the characters' classic look. I loved that Bee goes around in his original Volkswagen Beetle form. It makes you feel like a kid all over again. Out of all the Transformers movies this is easily the best, unlike the others it’s got a good story (not just skeletal looking robots fighting) and out brings your childhood memories. Bumblebee is a very good movie with lots of action, a few bad guys and tears. This movie was a hit in my family and we've watched it three more times since we got it. We're giving this movie 5 Stars and two thumbs up! Along with the movie, we were also sent a few Bumblebee toys that had my five year old even more excited about the movie. As we watched, he got to have his Bumblebee toys next to him. Available TODAY on Digital, 4K UHD, Blu-ray and DVD. For a chance at winning your very own copy on blu-ray, be sure to enter our giveaway below! Bumblebee & Optimus Prime are my favorite transformers. Honestly, I don't know them very well! The only one I know is Optimus Prime! But, Bumblebee seems pretty cute! Jet Fire is my fave. Bumblebee has always been my favourite right from the beginning, I don't know why maybe because he makes smile! I loved them all, but both Bumblebee and Optimus were faves. There were so many different variations and groups added when I was you it was hard to keep track, but the autobots were the best. Optimus Prime is my favorite. My son likes Optimus Prime. Bumblebee is out fav ! Bumblebee is our favorite Transformer! Of course our favorite Transformer is Bumblebee & looking forward to the movie! Bumblebee has always been my favorite because of his kind nature and compassion for the human race. Optimus Prime is my favorite transformer. My favorite is Bumblebee, of course! I like Optimus Prime the most. My brother had an action figure of him and I would play with that alongside my barbies. Bumblebee is my favorite. I use to watch the cartoon with my brother years ago and Bumblebee was always my favorite. Bumblebee is our family favourite. My favorite is Optimus Prime. I really like Optimus Prime. Optimus Prime is my favorite! So we like Megatron in our house . Oh so hard to choose! I am going to say for me its Optimus Prime! I don't know them but my grandson's favorite is Optimus Prime. My favourite is Optimus Prime. I like Cliffjumper the most of all the Transformers! Most definitely, my favorite Transformer would be Drift, but not the one from the movies, Armada, or Fun Publications, but from IDW’s comics. Optimus Prime is my fave Transformer. I like Optimus Prime the best. Optimus Prime is that dude! BumbleBee is so my favorite! I love him!!! Bumblebee is my favorite Transformer. I also like Ratchet.